My old roommate (and fellow Syracuse alum) Navin got married over the weekend to his longtime girlfriend Ruby. Ruby is Indian therefore we were treated to the full scale production of a traditional Indian wedding. The festivities really began last year during the engagement party that was bigger than several weddings I've been to. In a similar scale to the engagement party, the Sangeet was held on Friday night in Potomac, MD. This ceremony is similar to a rehearsal dinner except a lot more people are invited and some pretty impressive dance moves are on display. Ruby and Navin had a particularly impressive dance performance (shown below). I went solo to the Sangeet with my friends Doe, Mike and Dharmesh as Lori stayed home with the kids. The food at the Sangeet was phenomenal with some of the best samosas and chicken and lamb kabobs I've ever had during the cocktail hour. A round of curry, rice and meat for dinner topped off with some really good Gulab Jamon (Indian sweet dessert). All of this goodness and we still had the whole wedding left on Saturday. The wedding yesterday consisted of 4 stages. A Baraat (formal procession of the Groom's party) at 2 PM, wedding ceremony at 4, cocktail hour at 6 and the reception at 8. Since the wedding was up in Baltimore at the Inner Harbor we decided to leave Josh and Alex with my Dad and Lauren (thanks Grandma and Grandpa!) in Centreville, MD (across the Chesapeake Bay). We dropped the boys off at Noon thanks to some lingering beach traffic and got to our hotel at 2:30. Since Lori needs to feed Rebecca often we brought her with us to the wedding. By the time we checked in and got everything ready we headed over to the Marriott where the wedding was held (next door to our hotel) and JUST missed the end of the Baraat. 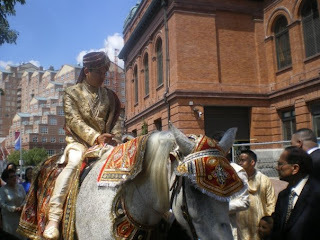 Unfortunately I did not get to see Navin riding a horse in the procession. Navin was dressed in full Indian/Thai dress and had a turban-style hat on that made him look very much like Aladin from the Disney movie. We made our way into the hotel and enjoyed some pre-ceremony appetizers (spring rolls, paneer and other Indian goodness). At 4 the ceremony began. It was a very long process (1.5 hours) and featured numerous prayers and rituals. I enjoyed my first real Indian wedding ceremony and appreciated all the tradition that went into it. 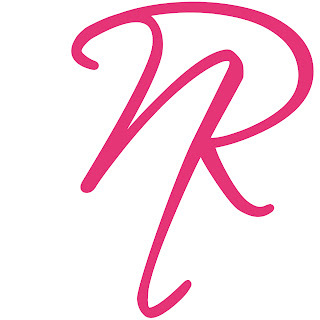 Ruby and Navin asked me a few months ago to design the logo for their wedding (shown here) as they wanted a monogram of their first initials in a unifying format. After a few rough drafts I thought the end result worked well and it was printed on their programs and menus. I was glad I could contribute to the event. Rebecca was a real trooper during the ceremony. She actually woke up just as it was starting and Lori and I took turns holding her throughout. She whimpered a bit at times but never really cried at all. The women behind us loved the smiles she gave. Cocktail hour was fun as I got to catch up with several friends from Syracuse I hadn't seen in a while. They did a really good job with the drink service as there were several bartender stations that never really got bogged down with any lines.The reception was as extravagant as advertised and featured professional belly dancing, amazing food, photographic cookies of the recently married couple (see Lori eating Navin's head) and a whole lot of crazy energetic Indian dancing. Lori and I got out there and made as honorary Indians on the dance floor for a few songs. At about 10:30 the dinner was served and Lori ate right away as she had to head out early to get Rebecca to bed at the hotel. I stayed and went to the after party at the hotel until 2 AM. Everyone was still going strong when I left. Ruby and Navin had changed into their pajamas and probably ended up partying until sunrise. Navin hasn't told anyone where they're going on their honeymoon (which is planned for Friday). I hope the two of them get to relax after all the hectic build-up to the big day. The wedding was truly an event to remember and we were so lucky to have such a good (and cute) daughter to make the experience even more enjoyable. We picked up the kids this morning leaving Bollywood behind and got home around Noon (just in time to see Tom Watson painfully ruin a remarkable story in golf). Back to a week of busy work for me then it's time to head down to the Jersey shore for our annual vacation. I'm REALLY looking forward to beach week and I hope the weather is similar to what we just had this weekend.